Kingsglaive: Final Fantasy XV is what you’d get if you took two hours of JRPG cutscenes and edited them into a movie: It’s oddly paced, confusing, and full of corny dialogue. It’s also surprisingly fun to watch. As a standalone movie, Kingsglaive is kind of a mess. Most of the plot threads are left unresolved, evoking feelings of a TV season premiere rather than a fully realized story, and it’s never quite clear what people want or why the bad guys are attacking. But as an introduction to the lore of Final Fantasy XV, one that sets the stage for Noctis’s epic road trip and offers a cursory look at some of the characters that he may meet along the way, Kingsglaive is a lovely little film, one I’m glad Square produced. If you know you’re gonna play FFXV, you should watch it. I mean, at least it’s better than Spirits Within. Remember when Final Fantasy XV was first revealed? Square’s flagship game stole the show at Sony’s E3 conference in 2013 thanks to an incredible, action-packed trailer that showed the crown prince Noctis fighting his way through his home city of Insomnia during a peace treaty gone awry. Well, it turns out the developers took that entire sequence out of the game. In this new version of Final Fantasy XV’s lore, Noctis has already left the city by the time the peace treaty starts, and Kingsglaive is our look at what happens during those tragic events. Watching that E3 2013 trailer in 2016 is depressing—it got so many Final Fantasy fans so excited, yet turned out to be totally fake—but it’s also a good tease for what ultimately became Kingsglaive. Kingsglaive, an animated flick that runs around an hour and 45 minutes, is a direct prequel to Final Fantasy XV. It introduces the world and sets up many of the conflicts that will presumably be resolved when the game comes out in November. Publisher Square Enix is banking that Kingsglaive will help draw people into the world and get more fans excited about Final Fantasy XV, but I should make this as clear as possible: This is not a complete story. It’s a prologue to a story that has plenty of hours left to go. The film begins with a Lord of the Rings-style narrative voiceover by the princess Lunafreya, aptly voiced by Lena Headey (aka Cersei Lannister). Luna explains, in a whirlwind of proper nouns and exposition, that the magical nation of Lucis is at war with their militaristic neighbor Niflheim. Niflheim has been invading nearby countries—it’s never really clear why—and Lucis has constructed a magical wall to protect their borders. We get a quick look at an important event 12 years in the past and then we jump to the present, where Lucis and Niflheim are waging battle after battle. After some battling and an obligatory “hero disobeys his commander’s orders to save one of his friends” scene, Nyx meets with King Regis, who has just learned that Niflheim inexplicably retreated from the battle. Niflheim was winning, so this is a strange move, rendered even stranger when an envoy from the Evil Empire named Ardyn (these names, you guys) comes and offers terms for peace. Ardyn, who wears a fedora, is clearly not right in the head, and his lip-syncing is disorientingly robotic. But his terms are simple: 1) Lucis has to give up their claims to all territory outside of the crown city, and 2) Regis’s son Noctis has to marry the princess Lunafreya. Kingsglaive does an excellent job of maintaining tension as Regis braces for a treaty signing that we all know is going to fall apart. Regis, voiced by Sean Bean, is a competent leader and fascinating character who doesn’t get nearly enough screen time. The movie also gives us a tantalizing look at the underbelly of Insomnia, where people aren’t quite as privileged as Noctis and crew. There are some interesting themes of expectation, nobility, and loyalty. Then, an hour into the movie, they all just disappear. The final third of Kingsglaive switches focus from heavy-duty politicking to a drawn-out sequence of fighting and fleeing, all starring Nyx. This is a drag, mostly because Nyx isn’t very interesting. The first hour of Kingsglaive moves at a swift, rapid pace, enhanced by Regis’s charisma and a world that’s fascinating despite its barrage of proper nouns. But when we switch to Nyx’s point of view, things start feeling weightless, especially during a nonsensical set of scenes late in the game where Nyx gets assistance from a group of royal ghosts. It’s fun to watch Nyx warp around giant mechanical ships and cross swords with giant demons, but it’s hard to care much whether he lives or dies. Some of the other names in Kingsglaive, in case you’re wondering, include Iedolas Aldercapt, Ravus Nox Fleuret, and Titus Drautos. At least Lord of the Rings had a guy named Sam. Add to the pot a bunch of baffling betrayals, some cliche lines of dialogue (“just make sure you come back in one piece!”), and a few too many characters who should be important but just don’t get enough space to make sense, like Luna’s brother Ravus, a ringer for Game of Thrones’ Viserys who hates Regis because of a tragic childhood incident in which Niflheim soldiers killed his mother and Regis couldn’t stop them. Really, this should make Ravus hate Niflheim, but instead Ravus decides to join the Evil Empire for... reasons? Think about it too much and it all starts to unravel. But does it matter? Kingsglaive is visually spectacular, and while I hope its storytelling isn’t a bad omen for Final Fantasy XV, I found its world and lore absolutely fascinating. The visual effects stun like no other—I don’t think there’s ever been a more beautiful CGI film—and the action scenes are a blast to watch. 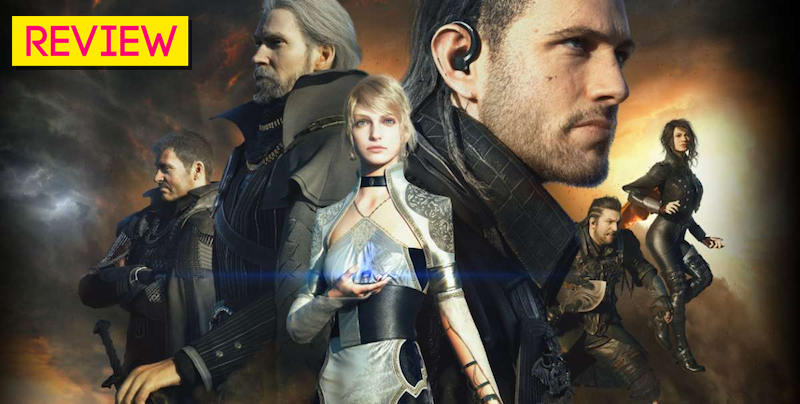 Unlike Warcraft, which had similar narrative issues, Kingsglaive is never boring. Even the moments that drag are a feast for the eyes. Just don’t feel bad if you need to take a trip to Wikipedia afterwards.